will be arranged 29-31 Jan 2010. More information should appear in this site later on. Meanwhile, you can read the old stories of previous events below. 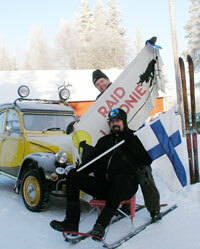 The 4th Miniraid Vehu will take place from Fri Jan. 30 to Sun Feb. 1, 2009 in Vehu, Finland. You are all very welcome to enjoy Finnish winter, snow, skiing, sauna, food, and 2cv friends in the middle of nowhere. Officially, the 4th Miniraid Vehu is part of the Raid Poronkusema. Thus the program will be somewhat shorter than previously. Raid Poronkusema will hit Vehu late in the afternoon. We will serve a common meal (soup á la Vehu, 7 e/person) in the evening. Sauna, hot bath tub, and other activities available. Music in the evening. A breakfast buffet (5 e/person) Skiing, sauna, kick sledging, “suvisivakointi” available. Those who wish may do "Raid Shopping Tuuri". A factory visit is planned on the way to Tuuri but it has not been confirmed yet. Other activities: sauna, skiing, etc. A dinner, mouton á la Vehu (12 e/person), and farewell party of Raid Poronkusema will take place. "Enough drink" - please remember to bring some local stuff suitable for this mixture. In the late evening there will be a "concert" by the frozen duck band. A breakfast buffet (5 e) will be served in the morning. We will clean the school house and leave Vehu. You may participate the 3rd miniraid vehu with your own 2cv or you may come to Vehu without a 2cv. Once again, we are very happy to inform that Ryanair supports heavily our miniraid Vehu by making cheap flights to Tampere. The distance from Tampere to Vehu is about 180 km. Vehu is familiar to the most of the SuperFinns and Mosquitofinns. The old school building can accomodate 28 people and additional accommodation can be arranged. Information at the Vehu Schoolhouse website and location. 2cv drive on the lake (depends on the weather), narrow roads in the wilderness. about 28 beds indoors at the school house + about 8 beds at the village church 100 m away + about 8 beds in a heated tent, if needed. In principle, you just need to come with warm clothes and enjoy everything. We would like to ask our Finnish participants to bring skiing equipments with them. A limited number of skiing equipments are available in Vehu. In addition, a limited number of kick slegdes, nordic walking sticks (suvisivakointisauvat) are at our disposal in Vehu. Please let us know if you plan to come to Vehu on Thusrday or leave on Monday. >Read stories of last year´s raid. Looking forward to seeing you in Vehu!